For the first time in South Africa, The Pink Geranium and the European company Wallflore® Systems present wall greening systems using recycled and recyclable materials to offer a durable, cost-effective, environmentally friendly building option. Green Walls are water wise and aid in reducing a building’s carbon footprint, starting with construction and continuing into the life of the building. It is an aesthetically appealing way to be practical in the issue of climate change. CO2 emissions from airconditioning systems in buildings around the world are only outweighed by transport emissions. It is imperitave to reduce these emissions as much as possible. 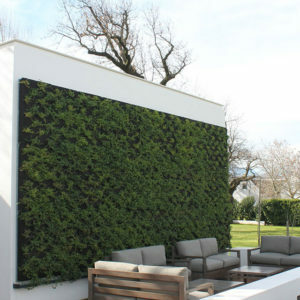 Green Walls has several advantages, including providing shade cover over the building, ensuring a lower demand for air conditioning during the hot summer months, which can be further aided by using the systems with an external insulation layer. Our product will also improve the air quality indoors through the removal of airborne pollutants, and used outdoors it can significantly reduce external noise levels. The structure of the panels and all the components of the support system are manufactured in fully recyclable alumnium 5083. The structural strength of aluminium exceeds that of stainless steel welding points and aluminium is unaffected by the corrosive mineral salts that would severely compromise the integrity of galvanised steel. The plants grow in a horticultural stone wool that is dense and yet light-weight, retaining its physical properties for well over five years. Green Walls are irrigated and fertilised by a built-in network of drippers, controlled by a remote automated station that delivers the correct quantities of nutrients and water to the plants depending on the season and the growth of the plants. The system also allows for the recycling of water through a built-in network of collectors. The light weight modular panels are easy to install, therefor lowering installation costs. Passive building requirements are met, and the components are fully recyclable or recycled. The system allows for rainwater recycling. All these factors make these walls environmentally friendly. Maintenance costs are lowered since the built-in irrigation system can use recycled water and is controlled remotely, and the irrigation drippers can be replaced easily without the removal of any panels. Green Walls come with a ten year insurance backed manufacturer’s guarantee on the aluminium system.